Download timetable pdf for easy viewing or printing. For more information on each class click on View Details for class descriptions. These classes are not included in the See Change Group training passes. Trainers operating Specialty classes are operating under their own business and independent of the services provided by See Change. You will be purchasing these sessions directly from the trainer. You will be entering into a payment arrangement with the trainer. See Change is not involved or responsible for providing the services. Kanga Training is a complete workout during which both cardiovascular endurance/flexibility and muscular capacity/strength are enhanced. Unlike traditional exercise classes, new mums need not worry about finding a babysitter or minding an unsettled baby during class because the babies are worn on them and get to be part of the action! As well as the physical benefits, the opportunity to meet other local mums in a fun, relaxed environment boosts their emotional wellbeing. Contact Lily Mudge for more information. If you are after the guidance of a Personal trainer in a small group situation, Strength Camp is for you. 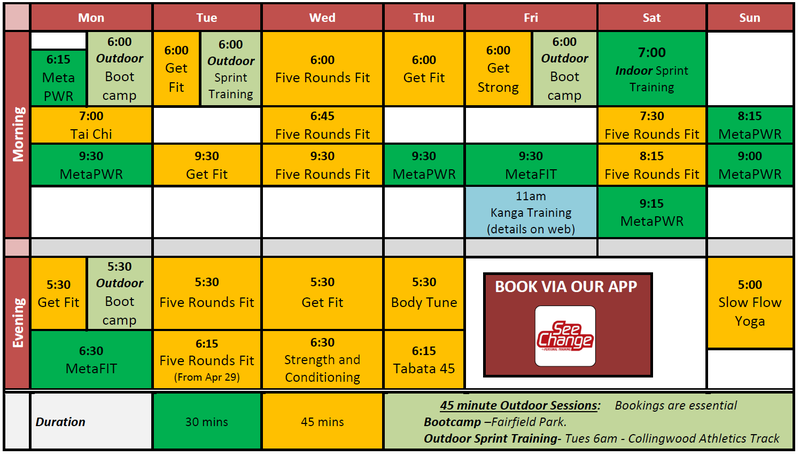 Declan’s Strength Camps are limited to 8 people. Each session, Declan creates a tailored workout program for you which aligns with your own specific goals. Declan focuses mainly on compound movements, programming progressive overload to get stronger whilst ensuring technique execution and safety is kept as a priority. Evening sessions run on Monday & Wednesday. Morning sessions run on Tuesday, Thursday & Saturday. Contact Declan on 0416376484 for more information. Nordic Walking: Nordic walking is fitness walking with specially designed poles and a learned technique to create an effective total body workout. Enjoy Nordic Walking with others, and benefit from the technical guidance and motivation of a qualified instructor. Come along and experience Nordic Walking for yourself ! Start with either a one on one or group beginners technique session. The basics may take one or a number of sessions to feel confident. Join a See Change Nordic Walking group. Bring your own poles, or hire poles from us. Please contact us to register your interest or inquire about Nordic Walking beginners technique session. Click here for more information and testimonials about Nordic walking with See Change. Click here. for general information from the Nordic Walking Academy. There are no contracts or joining fees to come to our classes. Check out our reasonable prices.